Set in the 12th century, during the reign of Richard the Lionheart, Ivanhoe tells of the love of Wilfred of Ivanhoe for the Lady Rowena, his father Cedric's ward. Cedric intends Rowena for the oafish Athelstane, and banishes his son. 'The love of battle is the food upon which we live - the dust of the mêlée is the breath of our nostrils! We live not - we wish not to live - longer than while we are victorious and renowned. Such ... are the laws of chivalry to which we are sworn, and to which we offer all that we hold dear. 'Set in the twelfth century, during the reign of Richard the Lionheart, Ivanhoe tells of the love of Wilfred of Ivanhoe for the Lady Rowena, his father Cedric's ward. Cedric, who is dedicated to the liberation of the Saxon people from Norman oppression and to the revival of the Saxon royal line, intends Rowena - a descendant of King Alfred - for the oafish Athelstane, and he banishes his son. 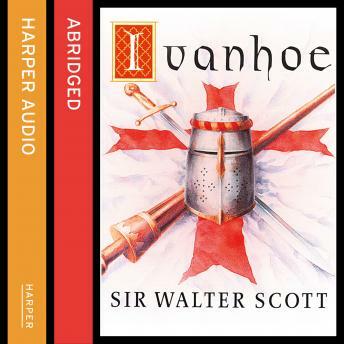 Ivanhoe joins King Richard on his crusade in the Holy Land, and eventually the two men return secretly to England - Ivanhoe to regain his inheritance and the hand of Rowena, Richard to secured his kingdom from his scheming brother John who has ruled in Richard's absence.With a gallery of memorable characters, high and low, Ivanhoe is a powerful and exciting evocation of a medieval world of jousting, baronial rivalry, siege warfare and trial by combat, and makes no attempt to gloss over the violence and brutality that lay behind the chivalric ideals.